LONDON. 9th December 2016. The Walt Disney Company, Lucasfilm and the UK Government’s GREAT Britain campaign announce a collaboration on the first Star-Wars standalone film, Rogue One: A Star Wars Story, which celebrates the British expertise, creativity and innovation involved in the Star Wars saga. The collaboration centres around a short film, featuring British Director Gareth Edwards, and celebrates almost forty years of GREAT British filmmaking. 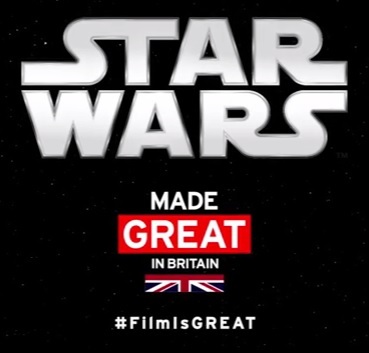 This marks the second phase of the Star Wars: Made GREAT in Britain campaign that launched last year in association with Star Wars: The Force Awakens, the UK’s biggest film of all time. The campaign, which also features fellow Briton and Rogue One: A Star Wars Story actor Felicity Jones in an Industry Trust IP awareness film, reveals the unique stories behind the nation’s contribution to Star Wars both in front of and behind the camera. The film will be launched exclusively online – and will be supported with short form videos and images that will run during the week of Rogue One: A Star Wars Story’s release. “It’s pretty phenomenal, the influence we’ve had on global culture. We really punch above our weight. "The creative industries are one of the UK’s greatest success stories, contributing a staggering £84billion a year to our economy and supporting 1.9million jobs. The UK film industry plays a central part in that success, producing an impressive roster of talent both on screen and behind the camera. Rogue One: A Star Wars Story will open in UK cinemas on Thursday December 15, 2016.